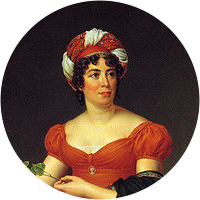 A collection of the best Madame de Stael quotations. To understand all makes us very indulgent. Politeness is the art of selecting among one's real thoughts. Politeness is merely the art of choosing among your thoughts. The mind's pleasures are made to calm the tempests of the heart. The pursuit of politics is religion, morality, and poetry all in one. Self-love, so sensitive in its own cause, has rarely any sympathy to spare for others. The more we know, the better we forgive. Who ever feels deeply, feels for all that live. There is no arena in which vanity displays itself under such a variety of forms as in conversation. The sense of this word among the Greeks affords the noblest definition of it: enthusiasm signifies God in us. The memories which come to us through music are not accompanied by any regrets. For a moment, music gives us back the pleasures it retraces, and we feel them again rather than recollect them. Nature, who permits no two leaves to be exactly alike, has given a still greater diversity to human minds. Imitation, then, is a double murder; for it deprives both copy and original of their primitive existence. I believe that happiness consists in having a destiny in keeping with our abilities. Our desires are things of the moment, often harmful even to ourselves; but our abilities are permanent, and their demands never cease.